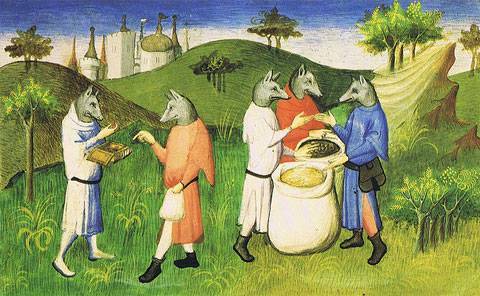 In Ancient Greek texts, the king Lycaon is punished for misdeeds by being turned into a wolf. 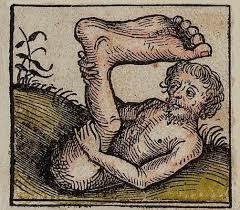 A werewolf in a German woodcut, circa 1512. An Athenian vase depicting a man in a wolf skin, circa 460 BC. The statue of Christopher Columbus in Columbus Circle, New York City. To try and understand the Russian revolution outside of the broader social context of the time is to neglect the development of nationhood in the region. Demonstrations in Petrograd, February 1917. Riot on Nevsky Prospekt, July 1917. Storming of the Winter Palace, October 1917. Map of former USSR States. A river in Van Diemen’s Land, charted during Nicolas Baudin’s 1802 journey. On November 2, 1816, Charles Repeat, “a poor old man”, was driving his master’s cart along the short route between Hobart and New Town in Van Diemen’s Land (Tasmania). He accidentally drove over a small tree stump, and was thrown from the cart and killed immediately. By that time the British had been established in New Town for about 12 years, and this road was part of the route to several settlements further out of town. It was not an unused back street but a main road, and yet drivers still had to avoid the deadly perils of tree stumps. Even main roads could be in poor condition. Macquarie Street in Hobart, 1833. It was not that roads were not important – a network of overland routes was quickly spreading to connect the growing colony – but they were not the only transport routes. Waterways were also vital to transport systems, as overland routes were rough and slow. In Australia, rivers played a pivotal role in giving European settlers access to the land beyond the immediate coastlines, and shaped the modern cities we know today. Charts of Van Diemen’s Land from expeditions by Abel Tasman, James Cook, and Nicolas Baudin reveal the extent to which these colonial explorers relied on rivers. The maps show water depths, fresh water supplies, and sources of timber for ship repairs. Mountain ranges are depicted as lines of peaks, as they would have appeared from the deck of a ship following the coastline. The world beyond navigable waterways was a place for speculation, not exploration. Once the British arrived in Australia, one of their main concerns was finding sites for further expansion. Surveyors and adventurers recorded the landscape around the primary settlements, sometimes combining them together as in the case of one chart, described as “A map of all those parts of … New South Wales which have been seen by any person belonging to the settlement”. Other charts were surveyed and drafted by one person, such as James Meehan’s 1804 chart of the land alongside Hobart’s River Derwent. Chart showing exploration route along the Upper Derwent River, 1828. In Tasmania’s hilly landscape, valleys were often more accessible than the scrub-covered hills. Rivers also served as stable landmarks to identify important points in the environment, and were useful for retracing steps. Even some 30 years after the British were firmly settled in Tasmania, rivers remained the starting point for pushing out into areas they had not yet explored. There were plenty more sensible reasons for concentrating on rivers, besides ease of access. They also provided the necessities of daily life: drinking water, irrigation for kitchen gardens, and a sewer for removing the less picturesque elements. This preoccupation with waterways is captured on charts showing the Tasmanian colony throughout the early 19th century, where all the settlements are based on the banks of rivers. Settlements around Hobart, based along the waterways. Even places that could not be reached by river, such as Bothwell, 60km north of Hobart, needed fresh water. Settlements like New Norfolk, 20km from Hobart, were used as transport hubs between Bothwell and the colony’s governing centre. Goods could move between river and road along these routes, depending on the infrastructure, urgency and weather. Individual properties could be focused on the rivers as well, with houses facing their front doors toward the main thoroughfare – the river. Tour guides at Woolmers Estate in northern Tasmania will tell you that the house was originally orientated towards the river. This was common among grand houses and small cottages alike. It was not until roads became more reliable that new properties began facing them instead. The Archer family at Woolmers renovated and built a grand new entrance, now facing an overland access route. This was a power move, as it made sure that guests approaching the house would pass through the most impressive land, and their first sighting of the house would be the entrance. They would be duly awestruck by the grandeur (and therefore wealth) of their hosts. The site of today’s Hobart central business district was chosen largely because of the waterways. The River Derwent was deep and suitable for ships, while the Hobart Rivulet (and others) provided fresh water for daily life and industry. Priorities change, however, and the rivulet has now been “all but obliterated from the city centre”, squashed into a series of culverts and tunnels. The history of Australia’s colonial-era reliance on waterways will not be so easily buried, however. In May 2018, Hobart was hit by storms that brought 100mm of rain in a few hours. Hobart’s rivulets and streams broke their banks with spectacular vigour, washing over streets and into buildings. This was not the first time the Hobart Rivulet has brought the city to a standstill, and it will doubtless not be the last. For those of us who live in today’s Australian cities, waterways can be easy to dismiss as simply picturesque places to paddle a kayak or have a swim. But historically they were so much more. In fact, without rivers, the people who sowed the seeds of our modern cities would not have got very far at all. The Aurora lying at anchor in Commonwealth Bay, Antarctica in 1913. Sidney Jeffryes photographed between 1912 and 1914. Mawson’s Australasian Antarctic Expedition in polar seas, 1912. Mawson’s hut at main base, 1911. Jeffryes’ cell in J-ward, Ararat Hospital for the Insane. The plaque unveiled on October 16 2018 in Ararat. Anti-Apartheid protest in the 1980s are mere snapshots of time in the long journey towards equality, paved by the sweat and blood of those in the African National Congress and beyond.